Two state legislators from Lake County are pushing a bill to reinstate child care benefits that were curtailed in an emergency executive order signed by Gov. Bruce Rauner earlier this year. With Senate Bill 570 scheduled for its third house vote next week, state Sen. Melinda Bush, D-Grayslake, and state Rep. Rita Mayfield, D-Waukegan, got together in Gurnee on Thursday to sign a pledge in support of the bill. "We want to be the hand-up and not the hand-out state," added Bush, explaining that about 90 percent of the people who used to be eligible now don't qualify due to the governor's action July 1. "It's a temporary hand-up program, one the Republicans started. You can only receive it for a limited time." In a 44-11 vote Illinois Democrats and Republicans voted Wednesday to override Gov. Bruce Rauner’s amendatory veto of a heroin prevention bill which would expand the use of the state’s Medicaid program to pay for methadone, extended treatment plans, and especially the use of Naloxone (Narcan), a drug that would prevent accidental deaths from overdose. Rauner cited budgetary strains for the Illinois Department of Health, as the reason for his veto, but did praise lawmakers for their care and thought in crafting the bill, which was a bipartisan effort and had original votes of 114-0 in the House, and 46-4 in the Senate. Other lawmakers that supported the effort were Sen. Dan Kotowski, who noted that “too many young people have died in our state,” and Sen. Bill Haine, D-Alton, who previously served as Madison County’s prosecutor stated, “As a former state’s attorney, I know the importance of punishing the dealer and treating the addicted,” Haine said. “This law will address the significant increase in heroin and opioid-related deaths and overdoses that has cost Illinois $4 billion. It will help save lives and make sure addicts receive the treatment they need. This override was a necessary step in the effective handling of a statewide issue,” reported the Belleville News Democrat. The bill which takes effect immediately, will allow first responders to be able to administer Narcan, in an overdose situation; it also creates a heroin and drug prevention education for schools, requires doctors and pharmacies to document when narcotics have been prescribed, increases penalties for fraudulently acquiring a controlled substance, cuts the “one and done” rule for non-violent drug offenders, and requires them to attend drug court, which has been found more effective at treating drug addicts, than jail time. It also contains a section referred to as “Lali’s Law,” which “would expand access to heroin overdose antidotes at local pharmacies. The law is “named for Alex “Lali” Laliberte, whose sister Chelsea formed the anti-heroin organization Live4Lali after her brother’s death by heroin overdose in 2008.”Elated by the news she said, "So many lives are going to be saved because of their efforts and the efforts of those who supported and developed this bill. It's been a long road." In The News: Heroin law will "save so many lives"
With a 44-11 vote by the Illinois Senate on Wednesday afternoon, the General Assembly completed an override of a veto by Gov. Bruce Rauner to enact a sweeping set of measures aimed at helping to reduce heroin and opiate addiction. 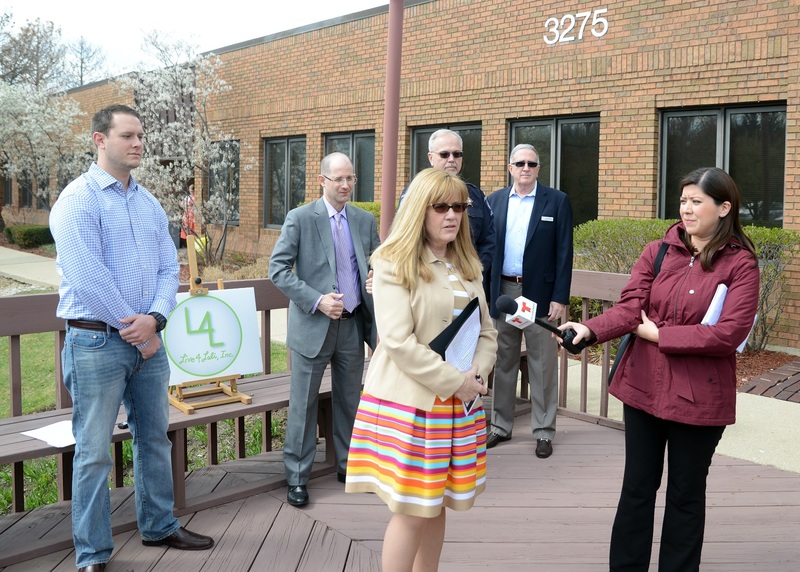 "I feel shocked and elated," said Chelsea Laliberte, a co-founder of the Lake County Opioid Initiative, a group that includes medical experts, elected officials and residents. Laliberte, in Springfield for last-minute lobbying and to witness the vote, said the law will "save so many lives." "There will be no more delay. This vitally necessary plan to address the heroin crisis in Illinois will be the law of the land," said state Sen. Melinda Bush, D-Grayslake, who sponsored a portion of the legislation and voted in favor of the override. House members had already voted 105-5 on Sept. 1 to override Rauner's veto. We have a heroin crisis in this state. Illinoisans are dying of heroin overdoses at twice the rate they were in 1999. Since 2012, in the Chicago suburbs alone, an average of three people have died a day. This week, Gov. Bruce Rauner issued an amendatory veto of the Heroin Crisis Act, a proposal I supported in the Senate that seeks to address the epidemic of narcotic use in Illinois. He declined to sign this bill unless the State of Illinois removes investments in treatment for those who need help covering the insurance costs. As a society, we are coming to grips with the reality that drug addiction is not a war, but a public health concern — that the answer is not brutish incarceration but medical treatment. Substance abuse costs our nation over $600 billion annually, and according to the National Institute on Drug Abuse, treatment can reduce these costs far more effectively than incarceration. A year of methadone treatment costs $4,700 per patient. A year of imprisonment in the State of Illinois costs $38,000. According to conservative estimates, every dollar invested in addiction treatment programs yields a return of $4 to $7 as we prevent drug-related crime. The governor would have us believe that we can't afford to spend money on treatment — the fact is, we can't afford not to. One of the provisions in the Heroin Crisis Act, Lali's Law, would expand pharmacists' ability to dispense the heroin antidote Narcan. Lali's Law is a direct result of years of work between my office and the bi-partisan Lake County Opioid Initiative, and is an example of the forward-thinking approach we in Lake County are taking to this heroin crisis. Expanded access to a safe and effective heroin antidote will only help save lives. Gov. Rauner's veto has effectively delayed action on a proposal that passed without opposition in the House and with a strong majority in the Senate; on a solution that every policymaker, every activist, every law enforcement organization and many members of the governor's own party have called for. Instead of having a law that could be addressing this issue now, it could be months before we see one, at a time when people are literally dying each day. If, like me, you would like to know why Gov. Rauner has declined to act, I urge you to contact him and make your feelings known.